Behold the miracles of Creation that surround you from the air you breathe to the fertile soil that brings forth bread from the earth and renew your spirit and your soul as you cast complacency aside and with awe and reverence open yourself to a clean and healthy renewal forgiving all who have sinned against you and seeking forgiveness from all against whom you have sinned. 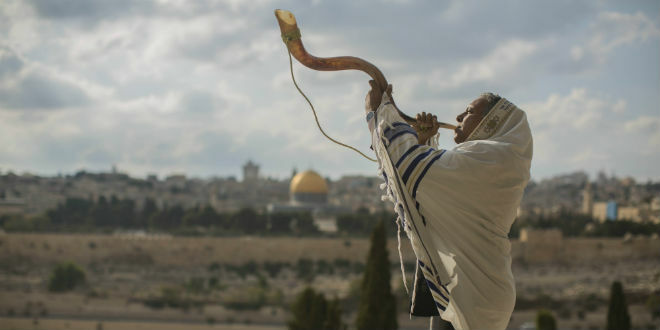 Poet’s Notes: On Rosh HaShanah, the shofar is sounded in three distinct ways. The first sound, tekiah, is one long blast performed with a single steady breath. It is an impressive, joyous, triumphant, happy sound that reminds the Jewish people that a fresh and hopeful new year is beginning. The tekiah is represented by the long prosaic sentence that makes up the first stanza of this poem. Alas, all joy must be tinged with sorrow, pain, and suffering. Following the propitious ring of the tekiah, the teruah and the shevarim remind the Jews that happiness never lasts. The second stanza represents the nine staccato blasts of the teruah and recalls the High Holy Day liturgy that relentlessly lists the various causes of death that may happen to those whose fate it is not to be inscribed in the coming year’s Book of Life. The third stanza represents the three short blasts of the shevarim and recalls that the sound of the shofar is a call to action and repentance. The breaks between the stanzas recall that the three soundings are performed separately using one breath for each and with a pause between each. Additional insight may be found here: http://torah.org/learning/yomtov-roshhashanah-vol3no16/ and here: http://www.leonardcohen-prologues.com/lyrics/prayer_who_by.htm.